I'm thrilled beyond words to be part of this blog tour. Rarely do I find a book that wins me over so completely with the quality of prose, rich storytelling, a deeply atmospheric setting and unforgettable characters. Paula Brackston is a force to be reckoned with, my friends, with the potential to become a classic. Please take the time to check out the book trailer. It will give you a great feel of the setting and the atmosphere. 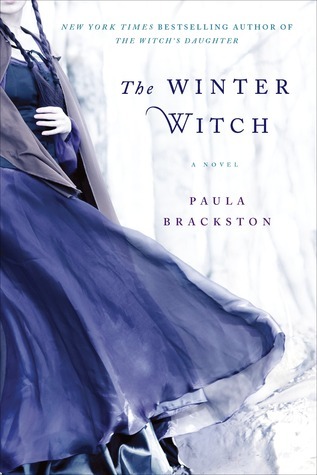 The Winter Witch is the second witch-themed novel by Paula Brackston (her first was The Witches’ Daughter, published in 2009), but if you’re worried about them being connected, rest assured, they are both standalones. I myself haven’t read The Midnight’s Daughter, but that didn’t stop me from becoming fully immersed in Morgana and Cai’s story. If anything, I was pleased to know that I have more of Brackston’s magic waiting for me in the future, be it The Witch’s Daughter, or her upcoming novel, The Midnight Witch. Although I read many fabulous books every year, rarely do I come across this level of quality in writing. Paula Blackstone writes boldly and confidently, and she’s done her homework well. Through her choice of words, her sentence structure and the elegance she infused in every sentence, she brought to life the unique setting and our two unforgettable characters. I am inclined to agree with The Guardian: The Winter Witch is worthy of being mentioned in the same sentence as the Brontë sisters. Imagine the mountains of Wales in 1830. Life is fairly simple, people are devout and very supersticious, marriages are arranged and lives are cheap. People get born and die with very little fuss. Try to imagine the wonderful nature, the horses and other animals, rivers and wells. Truth be told, with Paula Brackston, you won’t have to try very hard – she offers it all so easily – all one has to do is relax and enjoy the atmosphere. When you add to that the audacity it took to write a protagonist who doesn’t speak, you’ll realize that Brackston is an awe-inspiring author. Morgana doesn’t utter a single word in this novel, and yet she communicates so loudly with her new husband and their lovely housekeeper. Cai takes her silence for granted and doesn’t hold it against her, especially once he realizes how it came about, but the rest of his small town isn’t so accepting. Morgana is used to glances of derision from her neighbors, but Cai, unaccustomed to such treatment and fairly idealistic, doesn’t handle it very well. For all his kindness and mild temper, Cai was frustratingly oblivious at times. I wished to see him fight more bravely for Morgana, even though he never truly turned his back on her. What he did to defend her was endearing, but at times painfully insufficient. Nevertheless, I found their romance extremely believable and Cai a gentle, wonderful character, with mind and heart open and ready to accept the strangeness and wild nature of a witch. The plot here is fairly straightforward, with the villain clear from the very beginning. It’s not a mystery, but rather a story about the slow building of trust between two people who are essentially strangers, even if they are new spouses. There is something magical about their journey, an unidentifiable quality that makes The Winter Witch a truly outstanding read. Please make sure to check out Paula Brackston's Facebook page, and if you're still unconvinced, here are the first two chapters of The Winter Witch. This sounds like a fantastic read! Added to the TBR list! Great review as always, Maja! Seriously? Brontë-level writing? That's awesome and now you've made me very curious, though it sounds like I might have to repress the impulse to shake the oblivion out of Cai at times. These sound fantastic! I love stories about witches! Don't think I've ever read a story about a main character who doesn't speak, and that's pretty intriguing. I can't resist a good book about witches, especially set in later times. I think I am going to have to add this one and the first one to my TBR pile! Well, you had me at Bronte sisters tagline from the Guardian. Adding it to my TBR right now! Oooo this sounds fantastic! I love that she doesn't speak at all in this book, yet she communicates perfectly. She sounds fascinating and I want to meet her asap. I have a feeling I'm really going to want Cai to step up with a bigger, better defense of her as I'm already feeling protective, but I'm glad their romance still worked well for you Maja! Loving the sound of these characters and I'm so glad that the romance felt real. Plus, I love how the silence speaks volumes. Oh you have totally got me wanting this! I have been eyeing this book for awhile but no one had reviewed it until now. Sounds like a book for me, I am on the hunt for a good witch book and you know I can never resist great writing. Definitely getting a copy of this! This series has been on my wishlist, I am so glad that this works as a strong standalone. From the writing to the witchcraft this sounds wonderful. Wow I want to read this just for the writing! I can't believe Morgana doesn't speak throughout the novel, but you still felt like you had a sense of her personality and she communicated in other ways. Very curious about this one now, and I hadn't heard of it before your lovely review. Thanks for introducing me to this one! It sounds gorgeous. I can't wait to read it! I don't think I know this author or the series but I'm glad I do now. It's typically my kind of books! I love the period and it's intriguing to read a good book about withches. So thank you for bringing this one to my attention. Sounds like a neat series. Thank you. And glad to hear they could stand alone. This does sound wonderful and the video is beautiful! I'm thinking this is one I might really enjoy, I'm thinking of adding it to my WL.